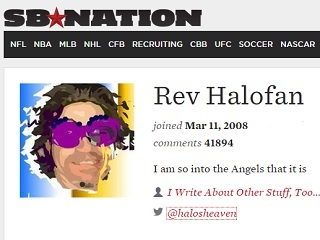 Halos Heaven editor crosses the lines of decency after outfielder is traded back to the Texas Rangers. Awful Announcing has the scoop on a foul bit of online sports journalism. The name-calling in the post was bad enough, but this paragraph was possibly the most troubling. If you’re going to write something this vile and hateful, put your real name on it instead of a pseudonym. Josh, when you finally die of a drug related matter it won’t be Arte Moreno’s fault. It won’t be the fault of the good fans in Anaheim who figured out your little game. They might have Donnie Moore’s karma on them but they won’t have yours. As much as I would like to say the blame for your future fate lies with the enabling national media and coddling players union, I think of Steve Howe’s face crushed against his truck’s windshield on a lonely interstate highway with crystal meth in his bloodstream and I know that all the blame will be on you, all of it, as it was with Howe. I can only hope that when you do yourself in, which you will, that, mercifully like Howe, you take nobody else with you. On Twitter, readers were quick to voice their disgust at Halofan’s article. And Lucia is right when he writes that deleting the post is not nearly enough. SB Nation should indeed also formally note and apologize.